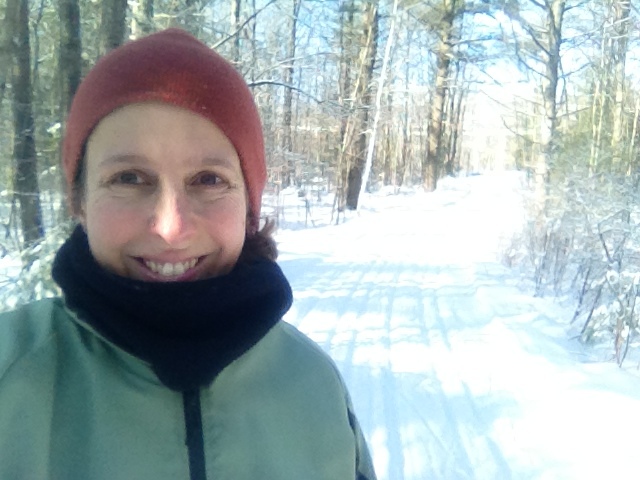 Today, New Year’s Day, I took to the woods for some cross-country skiing. 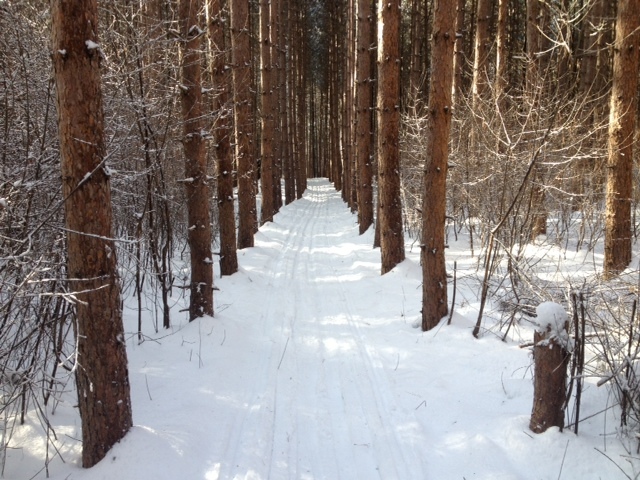 I went to a local farm where you can pay a few bucks for “25 km of groomed terrain”. This my second time skiing there -the first time was only hours after a blizzard and their snowmobile/groomer had broken down -right mired in snow (as we say here in Maine). A friend and I managed to get hopelessly lost as we tried to follow the map and avoid stumbling in the 4 foot drifts. This time as I set out on a bright cold morning, I was determined to follow the map and learn the trails. I like maps. My brother teases me about my excessive map-looking when we go hiking together. I can’t help it. There’s just something I like about having my path confirmed by a little piece of paper. Today it quickly became apparent that this was not entirely possible. Many trails were miss-labeled or unlabeled. Some were even labeled with two different names. A few trails were labeled with names that did not appear on the maps. It also seemed that whomever did the grooming enjoyed changing the trails at his/her whim. My first reaction was annoyance. I was plotting exactly what I was going to say when I checked in at the warming hut at the end of my ski. But after a little while I realized that map or no map I was having a pretty good time. The woods were crusted with sparkling ice, the snow was dotted with animal tracks and there was little noise aside from the occasional overhead crack of a pine branch. (I should add that this is a relatively small farm, bordered very clearly by roads and powerlines. There was very little chance of my getting lost in the wilds of Westbrook, Maine.) It didn’t really matter if I could follow the map. Instead, if a trail looked good, I followed it. If it looped back on itself, well then I chose another way to go. I had a great time and it was a good reminder that even for us type A map-followers, a little time off the grid can be good for us. 2013 has been a pretty damn good year. I look forward to 2014 as the year my first published book will arrive in the world. Along with that comes a lot of territory for which I do not have a map. In fact there are many experiences in life for which we do not have maps, or the ones we have provide, at best, a false sense of security. Sometimes it’s good to choose your way based on the best information you have on hand and a sense of play and adventure. Of course we remember you.Congratulations! Have your book on order from Ingram. Oh hooray! That was such a great weekend in so many ways! Hope I make it up your way again soon. -Such a lovely store! I believe this is one of the sujch a loot vital information for me. I like reading through aan article thzt can make meen and women think. Hi there! This is my first visit to your blog! We are a group of volunteers and starting a new project in a community in the same niche. But just imagine if you added some great images or video clips to give your posts more, “pop”! this website could certainly be one of the greatest in its niche. Pay – Pal account without having to steal any money from them.